Instagram today is rolling out a new shopping feature within its iOS and Android apps, allowing users to complete purchases without having to leave Instagram (via The Verge). Before the update, shopping links on Instagram opened up a pop-up web window on the retailer's site, which lacked stored payment information and likely caused many people to close the window. Now, Instagram users will be able to store their payment information in Instagram to use for many purchases on the social network. In return, Instagram is charging all retailers a selling fee, but the amount of the fee wasn't disclosed. Checkout on Instagram is starting with around 20 brands, including Nike, Dior, H&M, MAC Cosmetics, Michael Kors, Oscar de la Renta, Prada, Uniqlo, Warby Parker, and Zara. More brands are said to be coming down the line. Items eligible for the new feature will have a "Checkout on Instagram" button below their post. The first time that users tap this, they will be asked for a name, email, billing information, and shipping address. After the first order, the information is securely stored in Instagram. 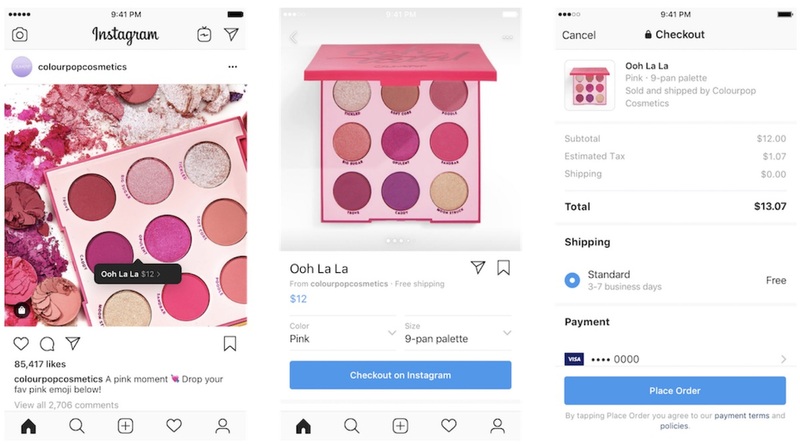 Instagram hopes that allowing people to complete their purchases inside the app will inspire them to shop more — and to create a big new business for parent company Facebook, which has recently signaled that it expects commerce and payments to represent the future of the company. According to Instagram, payment information stored in the app will only be used on Instagram, and not on Facebook. Instagram will also send notifications about shipment and delivery inside the app, to keep users updated on their orders. Checkout on Instagram is rolling out in the social network's mobile apps starting today. Hahaha, the last time I heard that I laughed so hard I fell off my dinosaur. Instagram = Facebook. Neither site is getting my credit card information. No way, no how. Maybe you're just getting beyond disconnected. People shop online. Brands, namely in fashion and makeup and influencers who show them off are incredibly popular on Instagram. Yes, people will buy things directly from IG and it's a brilliant move to monetize the platform. Yikes! I would never trust a transaction that convoluted.